Convened by: Birkbeck Sport Business Centre, and Africa Sports Unified. 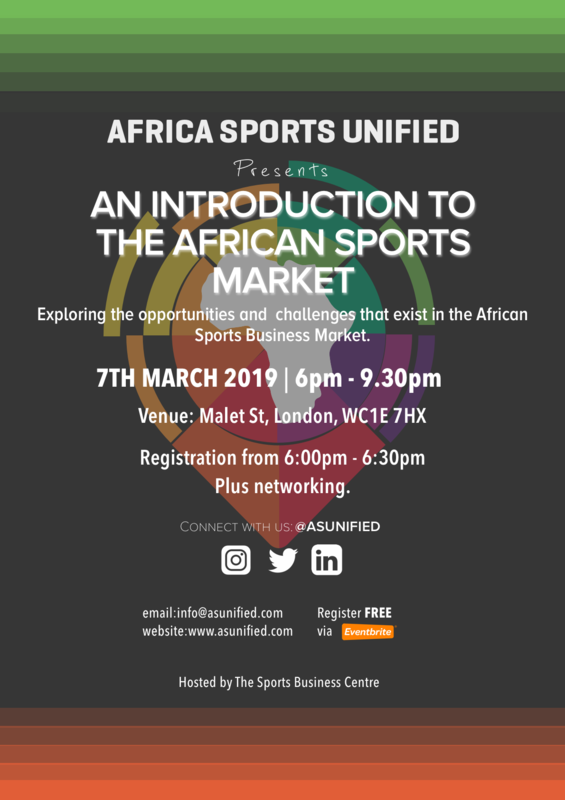 In this roundtable discussion a group of experts, convened by Africa Sports Unified, the sports business network focusing on developing African sports markets, founded by Birkbeck sport management alumnus Gabriel Ajala,will debate the challenges and opportunities presented by the increasingly mature sport business industry in Sub-Saharan Africa. Africa Sports Unified has been established to be the sports business hub for all African related sports, providing a community for those who wish to help build a sustainable sports economy and portray a true reflection on the growing sports market in Africa. A Sports Media consultant and the Founder & MD of Sports Media Africa with over a decade of experience in sports rights distribution and commercial exploration. Themba has worked with various African sports federations and has managed the distribution of broadcasting rights in Sub-Saharan Africa for a number of key sports’ properties.. He is also the co-producer of the African Sports TV Market report. Jairo Pachon, Eurodata Sport Ltd.
EuroData is a family-owned Sports Management Company, licensed by FIFA as match and player’s agents. It counsels, manages and represents football athletes from Latin America, Europe and Africa. It also works with national federations on the organization of international friendly matches. Drew is a licensed football agent, pr & brand strategist, and talent manager. He has worked with a number of notable names in the African music, sports & entertainment industry and has been instrumental in promoting some of the biggest comedy and music brands out of Africa such as ‘Africa AY Live’ and ‘One Africa Music Fest’.